Yup, Daiyun was born in 1931 in Guiyang, Guizhou Province, PRC. 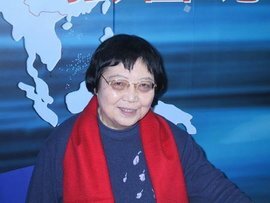 Her academic appointments include: Professor and Doctoral Advisor of Comparative Literature and of Modern Chinese Literature in the Department of Chinese Language and Literature at Peking University; Distinguished Professor at Beijing Foreign Studies University; Chair of the Center for Cross-cultural Studies (CCS) at Peking University; Editor-in-Chief of Dialogue Transculturel (a journal co-sponsored by Chinese and French academic institutions). λ Honorary Doctorate of Letters, McMaster University, Canada, May 1990.
λ Honorary Doctorate, Kansai University, 2006.
λ Lifetime Achievement Award, Chinese Comparative Literature Association, 2015.
λ Huilin Prize for Culture, Academy for International Communication of Chinese Culture, 2016.
λ Visiting scholar at McMaster University, University of Hong Kong, University of Melbourne, Leiden University, Hong Kong University of Science and Technology, Stanford University as a visiting professor. 20) Where to Find the Way Back Home. 4) Dialogue Transculturel (34 volumes).